There are many types of offers you must be seeing on the coming of New Year that relate to bikes, cars, computers and others. You can get huge discount on them that depends on you what you want to buy. If you are thinking about buying a laptop and confused which brand you should select then do not worry. There is an offer that gives you both happiness and high performance laptop with which you can do any multimedia work. 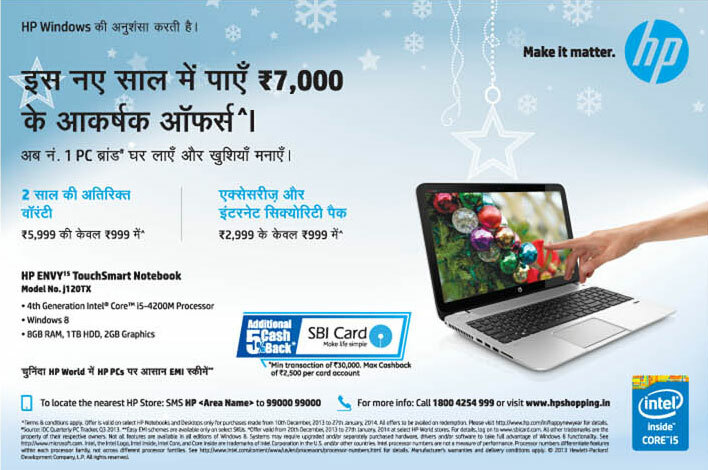 The offer is on HP brand laptop for only those who are SBI bank card holder. There are different scheme on different laptops of HP. Buying any, you can get 2 year additional warranty and get various accessories & internet security pack. You can pay in easy EMIs. So buy any high configured HP Branded laptop and play games and enjoy your New Year watching movies and listening music and others. It is one of the best offers that you are getting on laptops. So get it, what you’re waiting for!